This is not a cheap tripod. In fact, it just might be considered ridiculous to spend this much money on a tripod, and I don’t blame you. Gitzo GT3541 costs about $800, which, when you consider that cheaper bodies cost this much, it’s definitely on the high side. 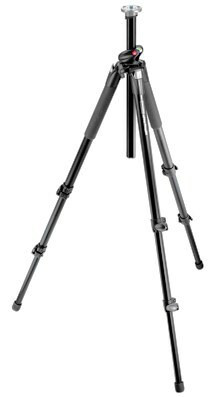 But, like anything in life, you get what you pay for and if you’re serious about photography, then this tripod makes perfect sense. It will in fact save you money over the long term. This tripod will take any amount of abuse thrown at it over many years and never fail to be perfectly stable and working well. It’s made of carbon fibre with absolutely no aluminum parts. This means that it’s lighter, stronger and more stable, leading to less vibrations making it’s way to your camera – and this means better photos. This is better than any aluminum tripod out there, period. Gitzo GT3541 can take being dropped, scratched or banged repeatedly and still performs. So at the end of the day you could buy three photography tripods in 2 years or just get Gitzo GT3541 for the rest of your life. This is a great tripod in the mid range of the pricing bracket. Manfrotto 055XPROB costs around $200 and is a solid performer. It is solid, reliable and quite stable, however, it’s definitely not perfect. First of all the paint seems to chip off quite quickly and easily after buying it. Leave Manfrotto 055XPROB in the sun, add a few humid days, maybe being thrown around in the back of a truck for a while and you will have it looking pretty messed up. This is purely aesthetic however, and doesn’t affect it’s real-world performance, but it’s still a negative. Another small point is that the centre column is plastic so you can’t be to rough otherwise it will break. On the plus side it has great quick-action leg locks, a decent built-in spirit level and is affordable. Manfrotto 055XPROB is the perfect choice for photographers looking for a tripod that delivers but doesn’t cost the earth. This tripod is simply the cheapest tripod around that is not a complete joke and waste of time. Dolica AX620B100 is a super-simple tripod that does the job without any bells or whistles. It’s made of aluminum and can handle up to 13 pounds of camera without hassle. This is great for photographers just starting out. While Dolica AX620B100 may not have the kind of performance as the ones mentioned before, this one can be bought for less than $40. It has some plastic components, is light and can take some abuse. This also makes a great second emergency tripod to have around in case your Manfrotto fails. These are your best bet when it comes to photography tripods.